The topic of this article may not meet Wikipedia’s general notability guideline. Please help to establish notability by adding reliable, secondary sources about the topic. If notability cannot be established, the article is likely to bemerged, redirected, or deleted. 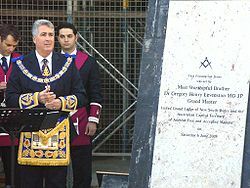 The United Grand Lodge of New South Wales and the Australian Capital Territory is the main governing body ofFreemasonry within the Australian state of New South Wales that also wholly encloses the Australian Capital Territorycontaining the national capital city, Canberra. It is not the oldest Grand Lodge in Australia, (that distinction being held by the Grand Lodge of South Australia, formed in 1884.) deriving its origin directly from the union in 1888 of the earlier 1845 provincial Grand Lodge under the United Grand Lodge of England and other provincial Grand Lodges. The Grand Lodge is further organised into 13 Regions, each led by a Regional Grand Counsellor (RGC), which are in turn organised into various Districts, led by a District Grand Inspector of Workings (DGIW), comprising groups of lodges based on geography. Districts are numbered using the Region number suffixed by a further number, hence District 103 is the 3rd district of Region 10. The geographically smallest is Region 12 Sydney Central and the largest is Region 13 Far West. There are no Region or District offices. Lodges meet in various buildings, ranging from individual lodge buildings to major city or urban centres, such as in Canberra. 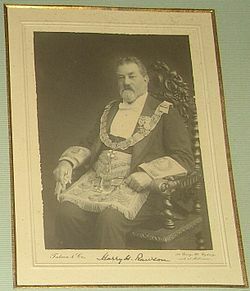 On 16 August 1888, after considerable consultation, the Masters and Wardens of the one hundred and eighty-three lodges assembled, the articles of union were again adopted, and the ” United Grand Lodge of New South Wales ” declared to be duly constituted and established. The first Grand Master was Lord Carrington,Governor of New South Wales. This article is about the organization in Australia. For the organization in New Zealand, see Knights of the Southern Cross (New Zealand). The Knights of the Southern Cross (KSC) is a Catholic fraternal order committed to promoting the Christian way of life throughout Australia. The Order was founded in Sydney in 1919 with the approval of the Catholic Bishops of Australia. In 1922 it merged with its Victorian counterpart the Knights of St. Francis Xavier. Branches operate in many Catholic Parishes throughout Australia and membership is open to Catholic men over the age of 18. St. Mary MacKillop is patron saint of the Knights of the Southern Cross. The order also established the non-profit aged care organization, Southern Cross Care. The Order was founded in 1919 in Sydney at a time Catholics were regarded with suspicion by the Protestant majority in Australia. The two co-founders werePatrick Minahan, a boot manufacturer and member of the NSW Legislative Assembly, and Joseph Lynch, a school inspector. Within a year of its establishment over 1,000 men had joined the order from every state in Australia and a national council was established to oversee the organisation. In the beginning it served to assist Catholics service men returned from World War I to find employment and to defend the rights and interests of the Catholic Church in Australia, a mission which it continues to promote today. Through the International Alliance of Catholic Knights, the Knights of the Southern Cross are associated with the Knights of Columbus, the Knights of St Columbanus, the Knights of Da Gama, the Knights of Peter Claver, the Knights of the Southern Cross (New Zealand) and the Knights of Saint Columba. The Association of Apex Clubs of Australia is the collective name given to the 330 individual Apex Clubs (service clubs) throughout Australia. An Apex club is a community service club, neither sectarian nor party political, that provides young civic minded people the opportunity to volunteer within the community as well as develop personally through club run schemes such as public speaking competitions. Club members are volunteers between the ages of 18 and 45. The first Apex Club started in Geelong in 1931 when three architects attempted to join the Rotary Club of Geelong. As Rotary has a rule restricting one profession to each club the three architects – Ewan Laird, Langham Proud and John Buchan went on to form the Apex Club of Geelong. Up until the early 1990s Apex only allowed male members. From this point until the 2006 National Convention, each Club had the choice of whether their Club was gender specific or mixed. It was decided at the National Convention of 2006 to merge the gender specific clubs (and boards) into one and for all clubs to accept members of both genders to their clubs. There are clubs in every state and territory of Australia and within each state there are several districts which clubs belong to. There are approximately 400 active clubs. Membership is open to all males and females between the ages of 18 and 45. Apex Youth Clubs are also being introduced that are school based which sees members between the ages of 14 to 18. Apex undertakes a range of activities aimed at youth with its major programs including running a Public Speaking competition in all states and holding a national debating final which both happen at the annual National Convention in July. Apex also runs the Teenage Fashion Awards in each state with the top 3 in each section heading to the national final, that is held in October of each year. Other events include the “Toyota Muster” held outside Gympie each year, as well as ute musters, B&S balls, and pretty much anything a club decides to organise. Apex over the years has raised large amounts of money to put into trust funds which then distribute grants each year, this is the responsibility of the Apex Foundation.